Before the beginning of the 20th century, it was believed that the atom was the smallest particle that could exist. After 1897, smaller particles were identified (Barrio Gómez de Agüero, 2012). As you saw in the previous section, the atom is composed of particles that can have an electronic charge (positive or negative), or be electrically neutral. These particles may also have mass, or be so light, for our purposes, we can say they have no mass. An atom has equal numbers of positive and negative particles, so overall is electrically neutral. Under a suitable heading, copy the following table into your NSD and complete with the correct charge and mass for each sub-atomic particle. Copy the sentence in bold, above, below the table. You should be able to remember all of this information for the exam, so test yourself and your classmates when you have completed it. 1. Matter is anything that has and takes up . 3. Protons are the sub-atomic particles that are - charged and situated in the nucleus of the atom. 4. Neutrons are the sub-atomic particles that are - charged and situated in the nucleus of the atom. The number of protons varies from one element to another, but all atoms of the same element always have the same number of protons. So, the atomic number (Z), is the fixed number of protons of an element, which is characteristic for each element. Elements are ordered according to their atomic number in the periodic table. In their natural state, atoms do not carry any electrical charge; they are neutral. This means that they have the same number of positively charged protons and negatively charged electrons. Therefore, in a neutral atom the atomic number also indicates the number of electrons. Z = atomic number = number of protons = number of electrons in neutral atoms. The number of protons and electrons is always the same in all neutral atoms of a chemical element, but the number of neutrons can vary. 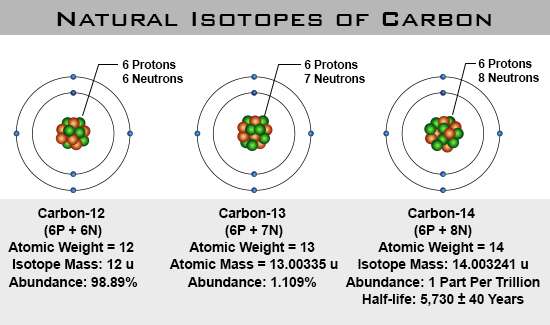 Atoms which present this circumstance are called isotopes. The protons and neutrons are situated in the nucleus of the atom. The mass number of an atom is the number of particles the atom contains. It is therefore, the sum of the number of protons and the number of neutrons. It is represented with the letter A.
Consequently, we can know the number of all the fundamental particles which form an atom if we know Z (the atomic number) and A (the mass number). All atoms have the same number of protons and electrons, positive and negative charges , so they are balanced overall and therefore electrically neutral. However, if an atom loses or gains electrons, the overall charge will change and will be unbalanced. If the charge is not neutral, the atom has become an ion. A positive ion is called a cation, and a negative ion is known as an anion. Task 4d: Complete the definitions below about atoms in your NSD. 1. The Atomic Number is the number of . 2. The Mass Number is the total number of . 4. A Negative Ion is a charged atom that has electrons. It is known as an . 5. 10. A Positive Ion is a charged atom that has electrons. It is known as a . 6. An Element is a pure substance that is made of only type of atom (e.g. gold, oxygen). Barrio Gómez de Agüero, J. (2012). Natural sciences, ESO 2. [San Fernando de Henares]: Oxford Educación.